By default the 0.1" male headers are delivered separately. I can solder them to the catellated via's. The AEMSUCA is a 0.8x0.6 inch board for the AEM10941 Solar Harvesting IC from E-peas. It efficiently converts solar panel energy into SUperCApacitor charge, it even works with indoor light. 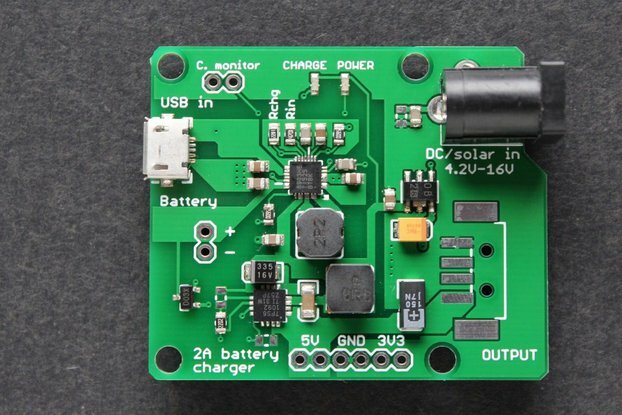 It features 3.3V and 1.8V regulated outputs that are enabled when the supercapacitor has sufficient charge, and a low voltage warning that informs the user of impending shutdown when the supercapacitor runs low. It easily integrates in other projects because of the castellated via's, and when soldered onto 0.1' pitch header it fits in a bread board. I am also selling a similar board that stores it's energy in a Li-ion battery. Check it out here. I designed it because I took part in the HackadayPrize2018 Power Harvesting challenge with a 1x1 inch Tiny Solar Energy Module and found a lot of interest in selling it. However since most projects have different power demands and people want to choose their own solar panel, I decided to remove the onboard solar cells. In addition I wanted a variant of the board that could charge a pair of supercapacitors. 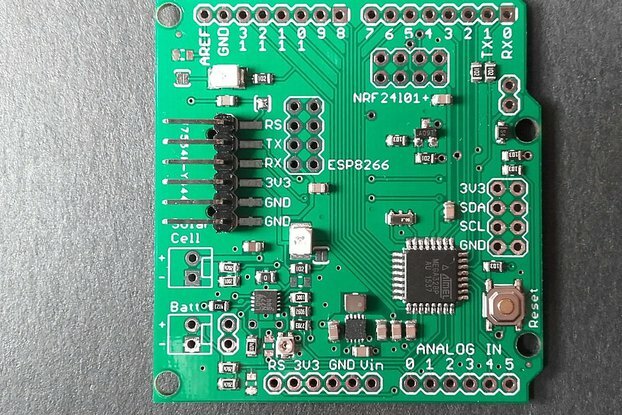 This board is special because it integrates maximum power tracking, supercapacitor charging and two regulates outputs in a tiny and easy to integrate board. There's is no other board with so little passive components. 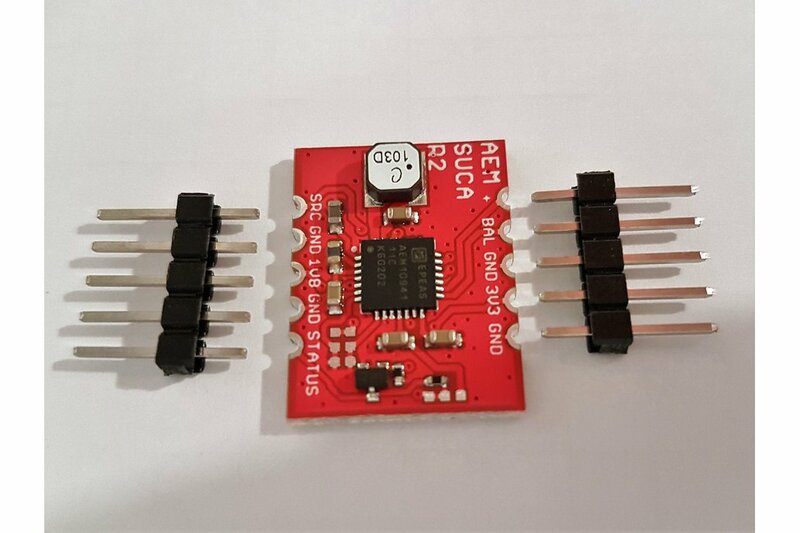 The AEM10941 harvesting IC is very suitable for indoor applications because it has an ultra low power startup. 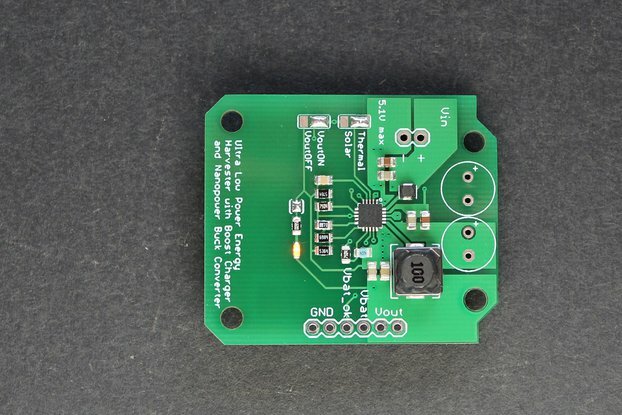 The boost converter starts at a very low 380 mV input voltage and 3 uW input power. The IC gets most power out of the solar cells by doing MPPT maximum power point tracking every 5 seconds. STATUS - status output pin, open drain output with 1M pull up to 3.3V, active low. When supercapacitor voltage falls below 3.6V it goes low 600ms before the 3.3V and 1.8V outputs are disabled. Can be used to warn the host MCU to gracefully terminate writing to EEPROM/flash and prepare for power outage. Voltage level 0/3.3V. What is the expected supercapacitor charge current? I have measured charge current using three different solar panels in indoor light (500 lux), outdoors in the shadow, and in full sun (~500W/m^2). Indoors (~500 lux) and with the smallest solar cell the storage element is charged at 50uA for 10 hours. Then the application must have an average current of (50uA*10hrs/24hrs) 20uA or less. That's enough for a simple Bluetooth Low Energy beacon or a very simple LoRa application. If that is not enough you need to select a larger solar panel. Outdoors, in shadow current is 10-20 times larger. And in sun 100 times larger. 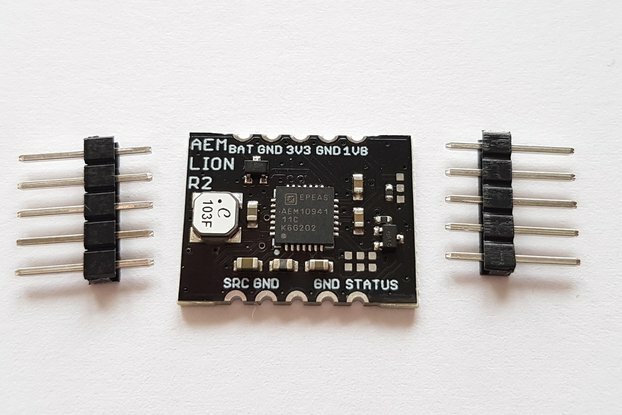 As you can see the AEM10941 can charge a supercapacitors from indoor light but indoor light is really only suitable for very low power applications. How long can an application run supercapacitors? What is the capacitance? Typical energy density is 5 Wh/kg while Li-ion batteries have 120-240 Wh/kg. So capacitance is 24-48 times less than a battery with same volume. What is the life time? Li-ion batteries have 500-1000 life cycles, supercapacitors have unlimited lifetime. Does a supercapacitor have high self-discharge? It is somewhat higher than an electrochemical battery. The supercapacitor discharges from 100 to 50 percent in 30 to 40 days. Li-ion in comparison has a self-discharge about 5 percent per month. Which super capacitor should I use? Depends really on your application's power requirement. I selected this 10F 2.7V AVX supercapacitor from AVX. It has relatively good price, low leakage (<1uA/72hrs) and reasonable dimensions. I tested leakage of a few supercapacitors here. Is a supercapacitor environmentally friendly? Yes, they do not have harmful chemicals and can be shipped and disposed without restrictions. Are they dangerous? No and yes. There is no shock hazard because typical cell voltage 2.7V is too low to hurt people. They don't get hot or explode like Li-ion batteries when short circuited. However they can deliver huge amounts of current. If you short them they will not set fire like Li-ion batteries, but they can make other things set to fire. Why don't they have shipping restrictions like Li-Ion? New Li-Ion batteries have charge while new supercapacitors don't and so the risk of fire is much smaller.